After dinner, the crew headed to Bonnie and Alexandra’s friend’s hotel room, where he and the rest of his program were staying during orientation. We hung out there for a little, and then Sarah, Kathryn, Bonnie, Alexandra and I took cabs to meet at Ocho7Ocho, which is a secret bar! This is a facet of Buenos Aires that I find extremely intriguing, and I read a lot about it before I left. It was a weird sensation to go to a place that I had read about, like the difference between looking at a map and standing on the street. Anyway, we walked into the very unassuming restaurant/bar, and then up to what looked like a wall with a no smoking sign on it. 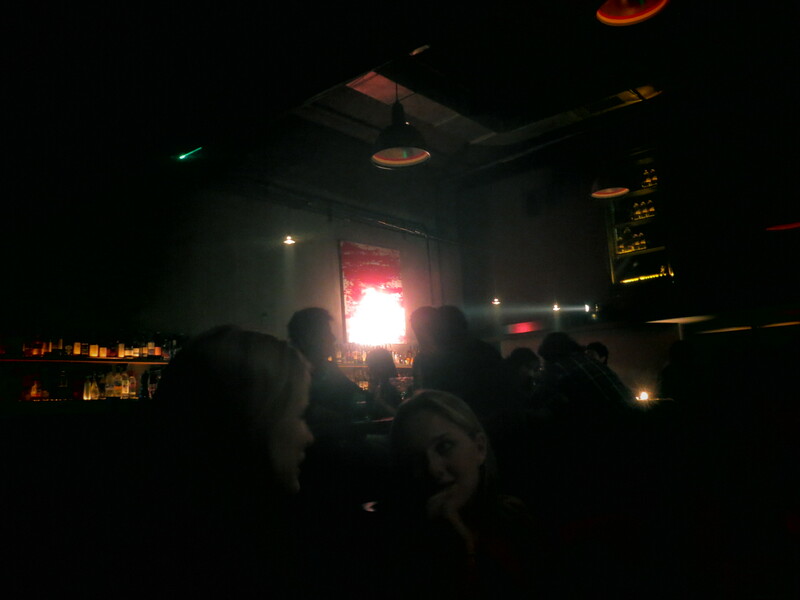 To my surprise, Alexandra pushed right through it, and suddenly we found ourselves in a “ve” swanky bar. After chatting with some of Alexandra’s friends from her program, one of whom found the place–props–we all decided to leave and go to a boliche. We walked around for too long and found out that the address didn’t exist, so Bonnie, Alexandra, Sarah and I decided to go to a 24 hour pizza place down the block from Bonnie’s casa. Sarah and I took a cab and got home at around 5:00. I woke up late and headed to grab a coffee with Kathryn at around 3:00. We’re still getting acclimated to our neighborhoods, so we decided to meet at our half way point (Santa Fe y Ecuador) and then wandered around until we found something good. We stayed and chatted for around two hours, enjoyed our coffee and late lunches, and spied on an adorable old man and his dog (who sat on a chair at the table) outside the café. I then went home for a while to relajar. At around 8:30 I met Bonnie and Petutti for a Coke and medialunas. We chatted and enjoyed each other’s company, but I was anxious to get home to Skype with my family. It was my mom’s birthday! (Wish I could have been there, Mama!) It actually worked out really well because my grandparents were over as well, and Lillian had just returned the day before from camp (her last year–unreal), so I got to see almost everyone! Nora mentioned on the first day I arrived that she wanted to meet my family over Skype, so she also got to see everyone. She and my mom talked together in Spanish, and it was all a little surreal. They had a nice chat! After my grandparents left and my parents were tired I talked longer with Lillian about camp and everything I’ve missed. I was sad not to be there for her last closing. But Pawnees won the Plaque, yeehaw! After class we went in groups to San Telmo to get our background checks for our visas. 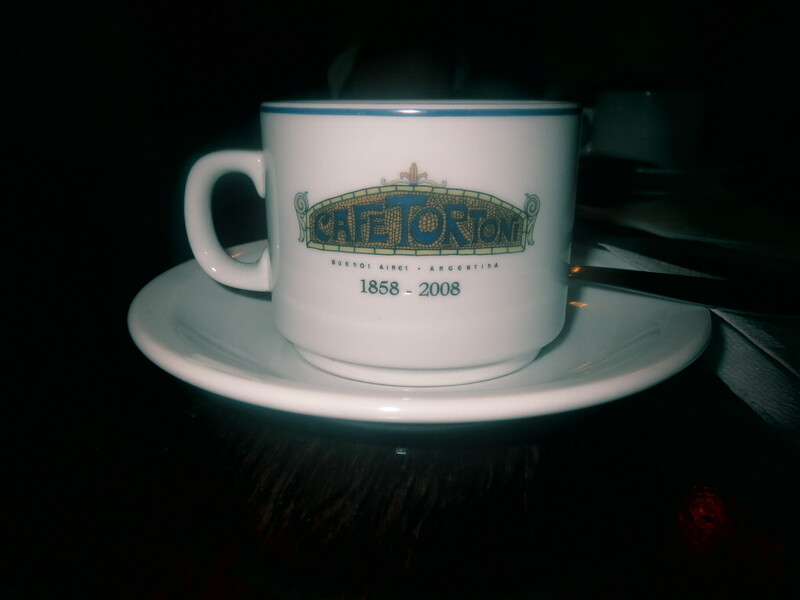 After, we walked to Café Tortoni, which is probably the most famous café in Buenos Aires. It’s crazy to think that Borges frequented the same place where I went to get coffee and medialunes (which were probably the best I’ve ever had)! It’s a place worth returning to, definitely. 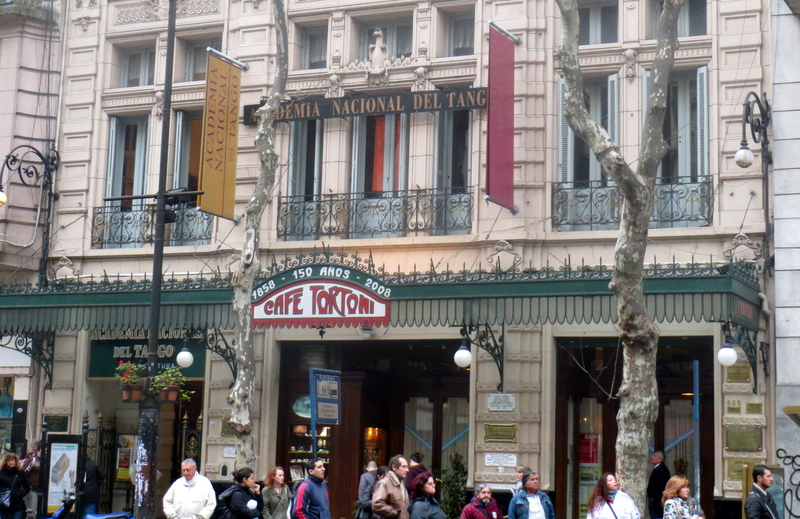 When we left, Sarah and I decided to walk home down Avenida de Mayo, which is the street that Café Tortoni is on, and about 12 blocks south of our usual path on Santa Fe. It was a gorgeous stroll, and we spoke Castellano the entire time, which was very satisfying and actually pretty fun. 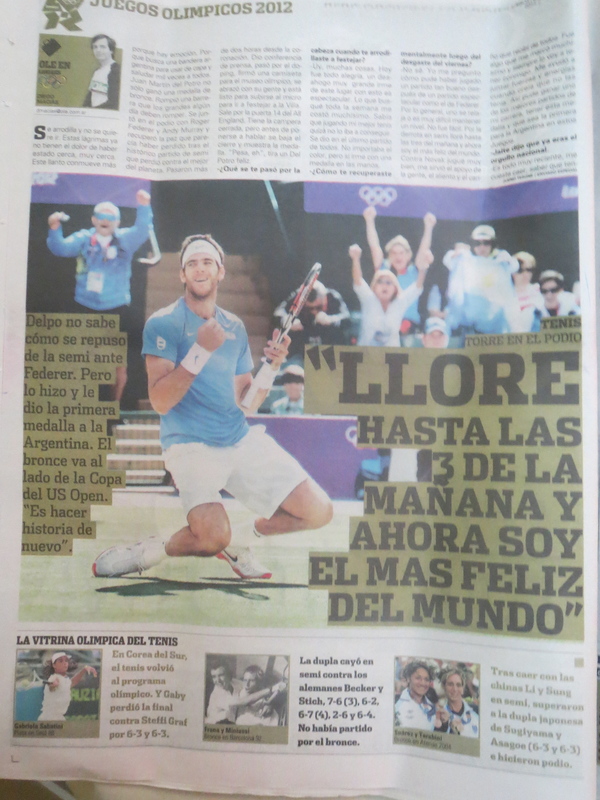 We saw the Congressional Plaza and I bought a sports publication called Olé that had a huge section about Del Potro, who had won the bronze medal in the Olympics the day before. He was ALL over every newspaper. This was Argentina’s first medal from London! Before we got home we also made a quick trip to the grocery store so we could eat cheaper lunches at home (we are provided breakfast everyday, and dinner only Monday-Friday), rather than continuing to eat at a crazy amount of cafés. It was funny to see so many American brands mixed in with the very unfamiliar Argentine ones on the shelves. We got sandwich fixins, yogurt, rice cakes, etc. That night, Nora made us a delicious dinner of steak and sweet potatoes (batatas), and later we headed out to meet about 10 friends from IES and go to Severino, a boliche south of the center. There was no cover since we arrived before 1, and they played strictly American music from the ’90s and ’00s (even a Beck song! I was so, so happy), so I had a great time. I got home at 3ish. Nora woke up me and Sarah at around 8 to let us know that we had forgotten to close the “accordion door” (so we call it) to the elevator when we got home, and it wouldn’t work for anyone in the building when they were trying to get to work and school. She apologized for waking us up so early, but made it clear that this could never happen again. Apparently, so many people were pressing the buttons in frustration, and the elevator ended up breaking. Grande oops. We ended up lavantándonos at around 10:30. We needed to get our laundry done that day, so we had to make our way down the stairs with tons of bulky bags, and we couldn’t lock the dead bolt to our door from the stairs. It was a stressful morning. We somehow made it to IES by 2:00 for our cultural event of the day, which was a trip to La Boca! On the bus ride over we learned some Argentine history, which was great because that is something of which I knew (and still know) little. One thing I was shocked to learn about was the Guerra Sucia. Absolutely terrifying, and uncomfortably recent–worth reading about. Anyway, when we arrived we toured the soccer stadium for the Boca Juniors team, which didn’t particularly interest me, but I’m not going to keep that fact on the down low because I think I could actually be a victim of a violent crime for thinking that way in this city. Our tour guide told us that the fans are intense, and are known for their violent rampages (yay!). 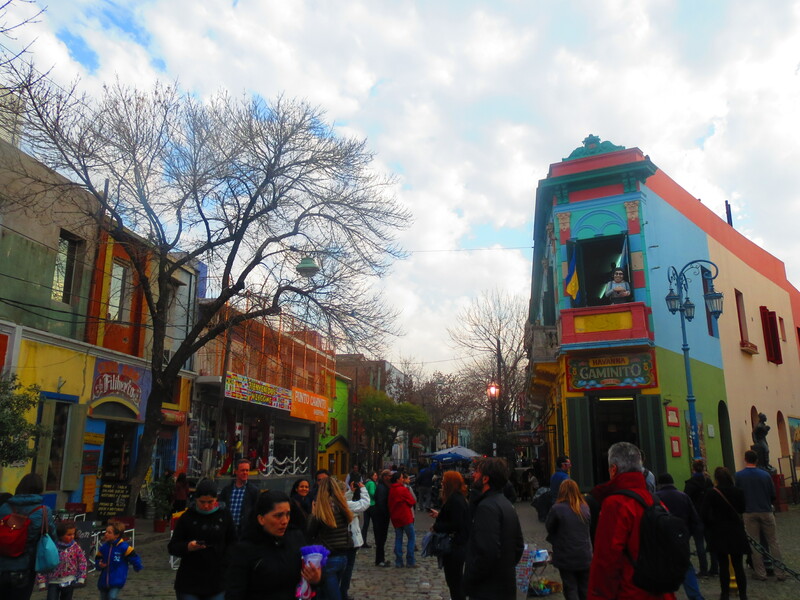 What I loved was the La Boca area itself. I took casi un millón de fotos. ¡Que copado! 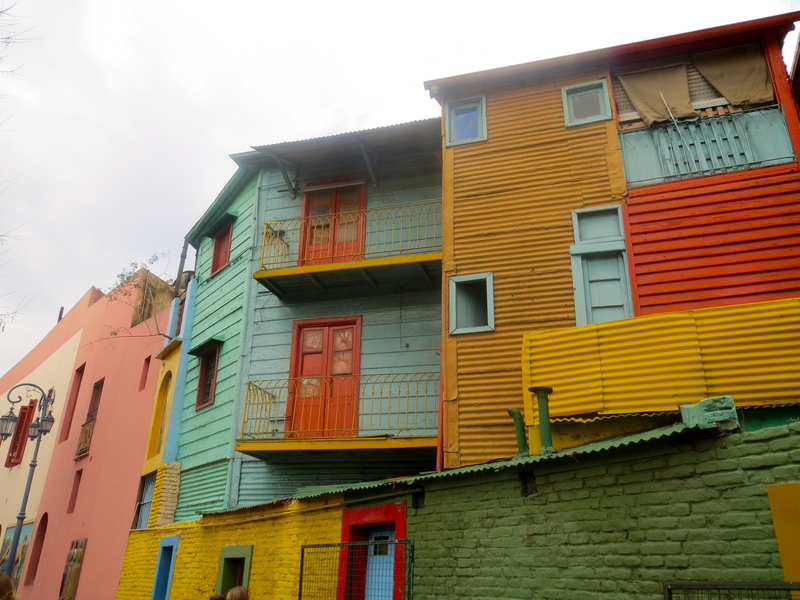 La Boca almost reminded me of parts of San Antonio, but on some serious steroids. We returned to IES at around 5:00 and headed home, stopping on the way to get flowers for Nora, who had to deal with angry neighbors on our behalf. She was so appreciative and happy when we gave them to her, que linda! That night for dinner we had torta de atún, which was incredible. We also had a type of orange and chocolate cookie pudding, which Nora thought up and created. It was strange, but definitely good! I am very impressed and appreciative of her cooking skills. Later that night I met Bonnie and Kathryn in front of Kathryn’s apartment building so that we could walk to an American bar called Jobs, which was right down the street. We met some IES people there, and had a lot of fun. At around 2:00 we left in search of food in the direction of Palermo (see: the opposite direction of where I live). We were unsuccessful, so I just took a cab home. In the cab I realized that I only had 22 pesos, so I told the driver to take me as far down Santa Fe as I could afford. He told me he was nervous though, since it was late and a good amount of blocks away. I thought I would be okay since Santa Fe is a busy street, but he seemed really concerned for me. The meter passed 22 pesos quickly, but he kept driving. We chatted and introduced ourselves, and he asked how long I would be staying in Buenos Aires, if I liked it so far, etc. He ended up driving me all the way to my casa, about 15 more pesos than I could afford. I offered to stop at an ATM, but he said not many places would take a foreign card. I couldn’t believe how unnecessarily kind the taxi driver was, and I was so grateful that he cared enough about a random foreigner to get me home safely even if it meant losing money. When I got to my house, I gave him every peso I had, as well as the guardian angel coin my mom had given me before I left. He was definitely my guardian angel that night, and I just wanted him to have it. The night’s adventure was not yet over, however, because after mi ángel drove away, I noticed a man standing in front of the gate to the apartment. He was obviously drunk, stumbling and mumbling things. Sarah texted me earlier in the night that she had heard him outside her window, but I was sure he would have found another place to be scary by the time I got back. Bad guess. I hid by the gate to another apartment building to wait and see if he would stumble away, but, naturally, he saw me and started walking toward me. I quickly walked further from him, turned around and saw that he was following me, and then sprinted around the block. By the time I looped around, he was nowhere in sight, gracias a Diós. Shout out to Kathryn for staying on the phone with me until I got safely into my building! Today I woke up at 11:45, and almost immediately went to the ATM. I don’t want to press my luck after last night! I had leftover pizza for lunch at around 1:00. I had to be at IES at 2:30, but Bonnie and Alexandra were eating lunch at El Ateneo, an extremely famous bookstore two blocks from my house, so I joined them for about 20 minutes, and then booked it to IES. 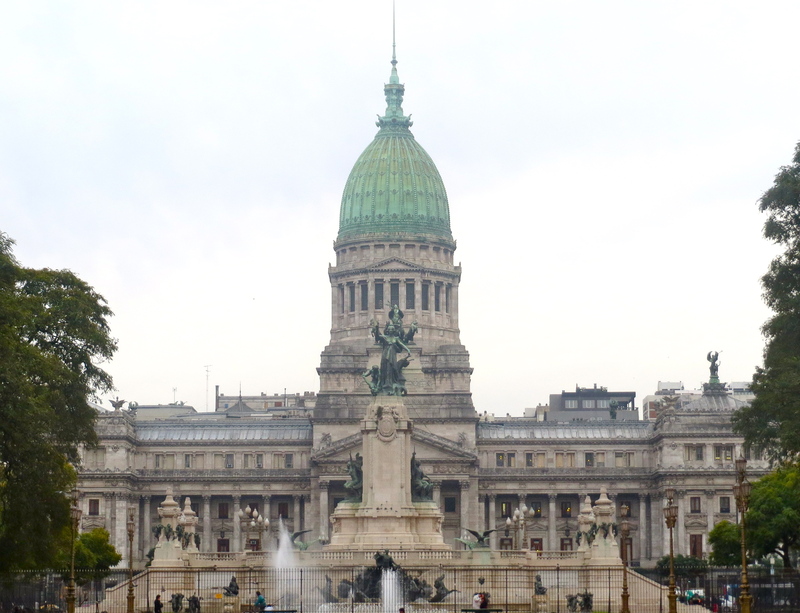 From there, my group walked what seemed like 20 blocks to the Museo Nacional de Bellas Artes, which is probably the most famous museum in BsAs. I saw Manet, Van Gogh, Rembrandt, and more. It was a great collection, but I think I want to go back later when I’m less tired and without a tour guide. We had to skip over some really nice pieces in the interest of time. Nora has to work late on Wednesdays, so for dinner Sarah and I warmed up some tarta de atún and tarta de cebolla, both of which were fantastic. We later took the colectivo to meet Bonnie for coffee by her house, which was fun. There seemed to be a big Boca Juniors game on, because everyone in the cafe had their eyes glued to the screen, except of course when we walked in. We must look obviously American because they were staring hard. On the bus ride back, Sarah and I got to sit down, which is a rarity on public transportation–especially this week, since the subway is on strike. There is so much more I want to say, but I’m exhausted, and I need to wake up semi early for class tomorrow. I also have a feeling that there are a lot of spelling errors in this post. Oh well, ciao! 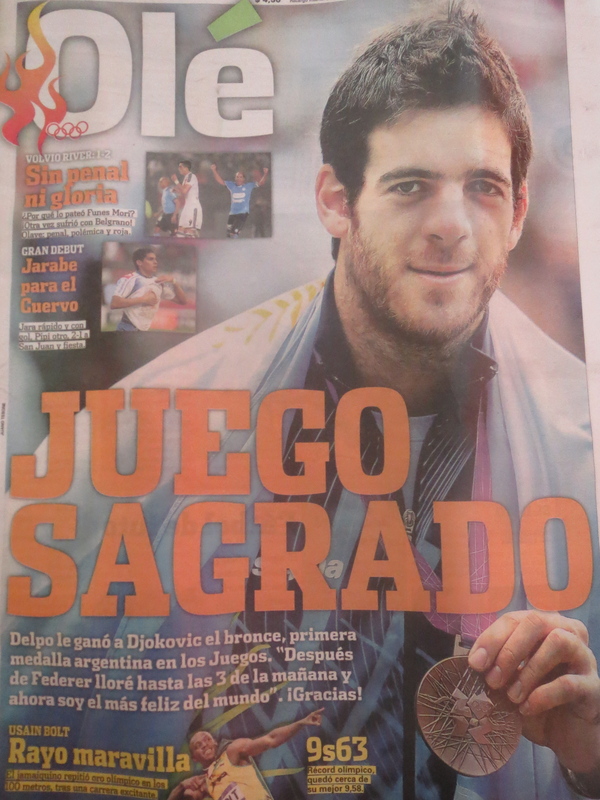 This entry was posted in Diario, Photos by wallajg0. Bookmark the permalink.